On Saturday it was 70F, but last week, as predicted, the overnight temperatures briefly plunged below freezing several nights. For last Monday’s vase I had rescued many camellias as well as the last few Zinnia ‘Profusion Fire’ flowers. And, surprised by how fresh the zinnias remained all week, I decided to display them again for today’s arrangement in the same small kenzan Ikebana vase. The red-orange zinnias are paired this week with shasta daisies and photographed in early morning light atop my daughter’s contemporary cherry table. Though only five in number, shasta daisies in flower at the end of November are unusual. 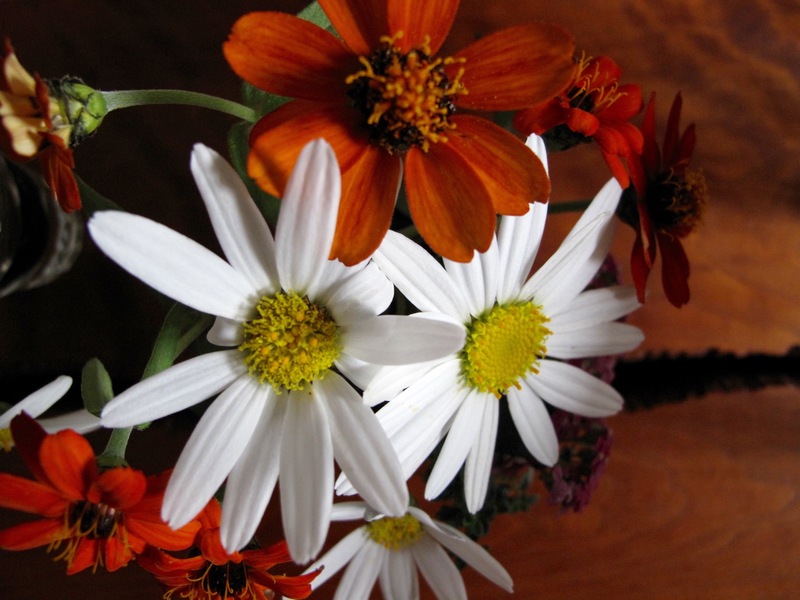 Three of the daisies fit into the vase with the zinnias. 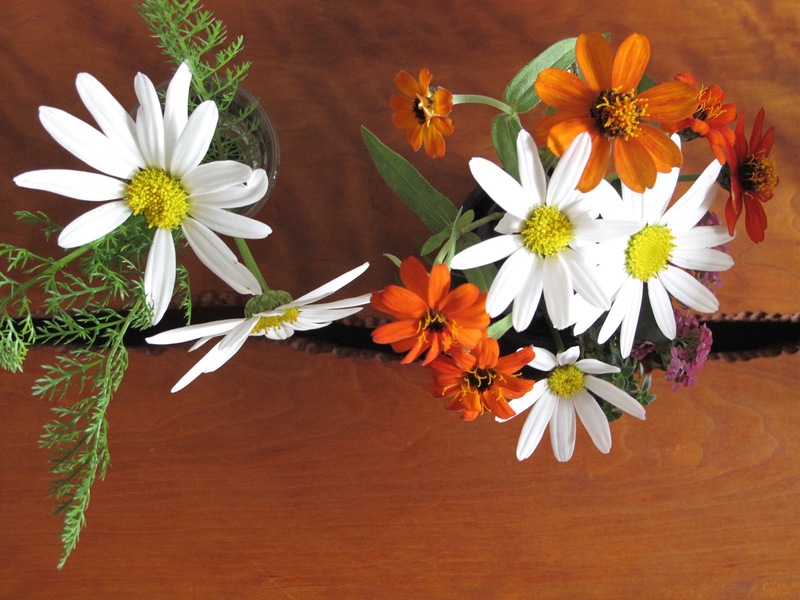 The other two daisies sit in a clear shot glass with some yarrow foliage, all held in place using a half-inch size black kenzan. 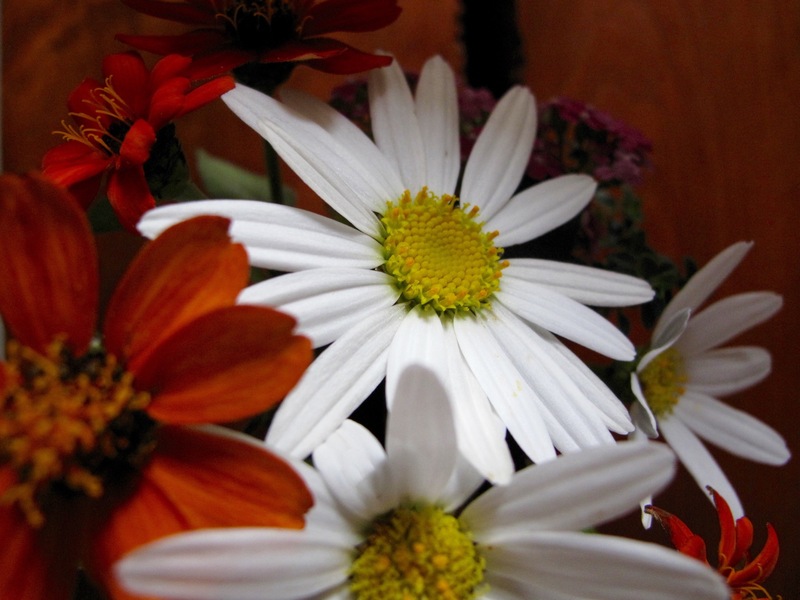 This entry was posted in garden and tagged flower arranging, flower design, in a vase on monday, Leucanthemum x superbum (Shasta Daisy), nature photography, Zinnia 'Profusion Fire' on November 30, 2015 by pbmgarden. Perfect for the last day of November! It’s surprising how well the zinnias look, almost like they were just picked. Thanks Marian. Where did November run off to? 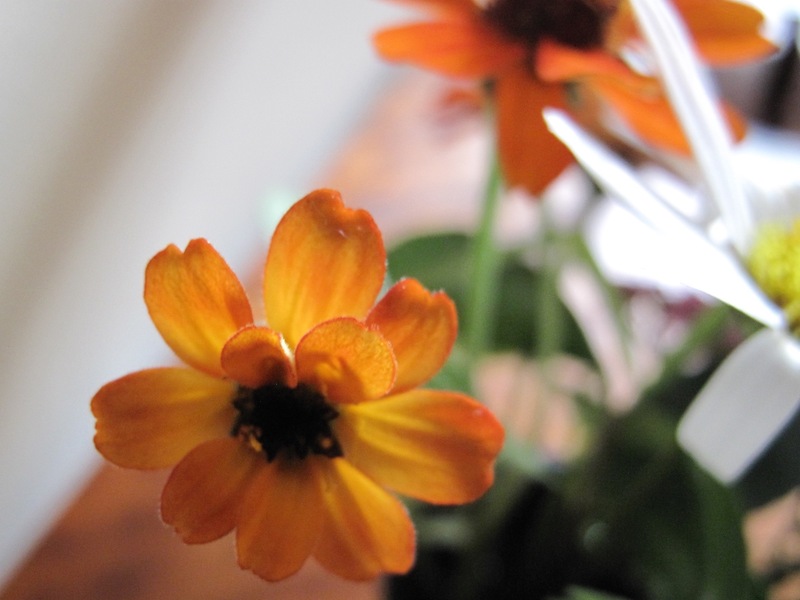 such fresh and vibrant blooms – these images take me back to summer days …. Our weekend was almost summer-like, 70 degrees F. each day. Rainy and cooler today, but it was so nice to be in the garden. It is great that the Zinnias last so long, I had some in the kitchen for two weeks, but the end they were fading beautifully but not dead. 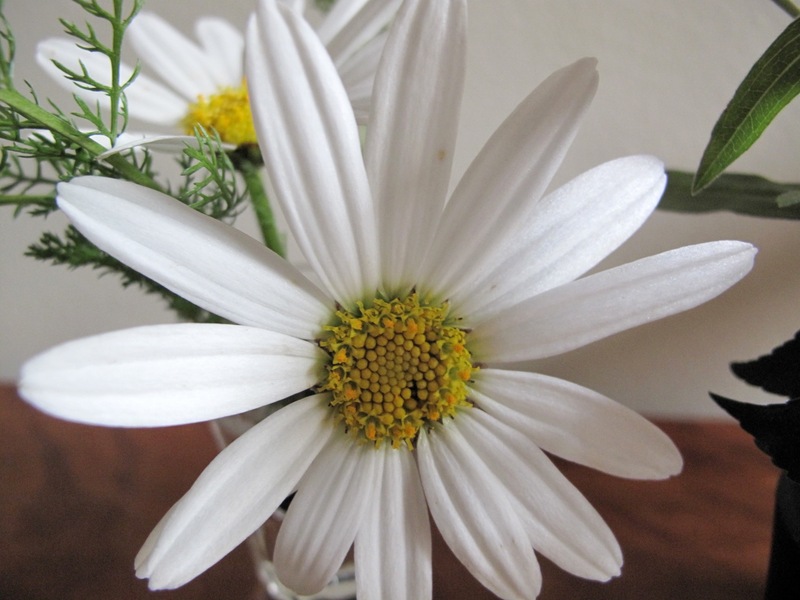 The daisies are a lovely addition to your vase. Christina, this little ‘Profusion Fire’ has a great color. It didn’t bloom well during much of the summer when my other zinnias were going strong, but it started flowering better with cooler weather. Nice to have it now for indoors. The Shasta Daisy’s provided a bright light here during a full November day. Glad you liked them Brian. Those white shasta petals seem almost unreal. 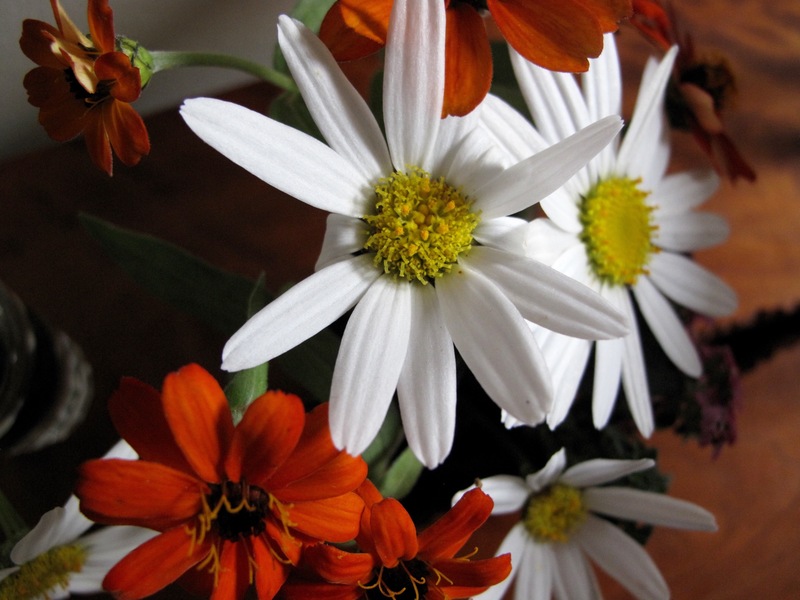 The Shasta daisies and zinnias make a cheerful combination, Susie. I reuse flowers and other plant material with a fair degree of frequency but I’m still impressed by how good your zinnias look. Thanks Kris. It’s nice when a previous vase can give inspiration for the next–the ultimate recycling. I am also impressed by your zinnias, they look perfect. I also have some yellow daisies that still look very well on my terrace. Nice you still have some daisies Anca. Glad I brought the zinnias indoors last week. The plants themselves succumbed to the freeze. Can you explain what ‘kenzan’ means please, Suzie? The shasta daisies make a lovely combination with the zinnias, although I think it would be easy to confuse the zinnias with something else, especially at the end of November! They have been great ‘doers’ for you this year, haven’t they? Hi Cathy. A kenzan is a floral pin used in Ikebana (Japanese flowering arranging). It has a heavy base and closely placed needles/pins for holding the flowers in place.These small Profusion series zinnias were not as prolific bloomers as I’d expected during the summer, but they made a late rally to try to redeem themselves. Thanks for that Suzie – so a posh name for a pin holder! Your zinnias look freshly picked!! 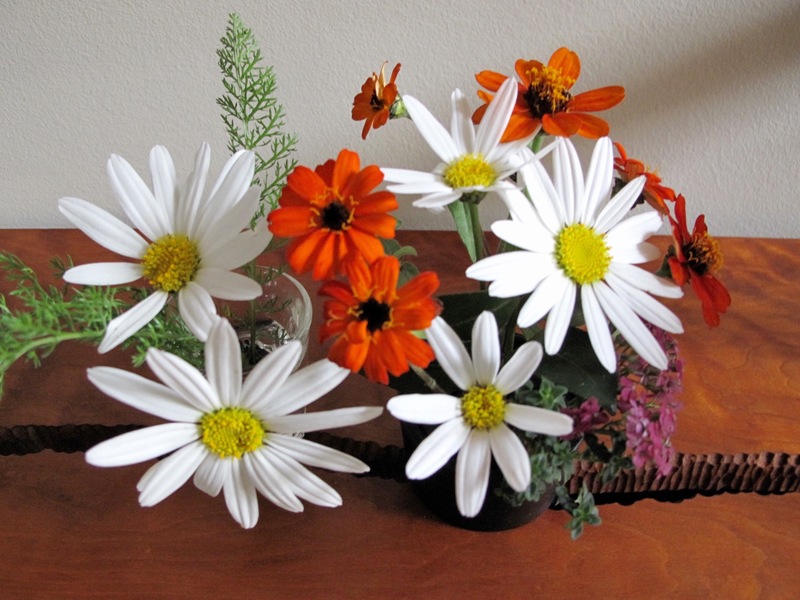 A delightful combination with the shasta daisies and they are set off so well by your table. It sounds like winter is on its way! Thanks Julie! 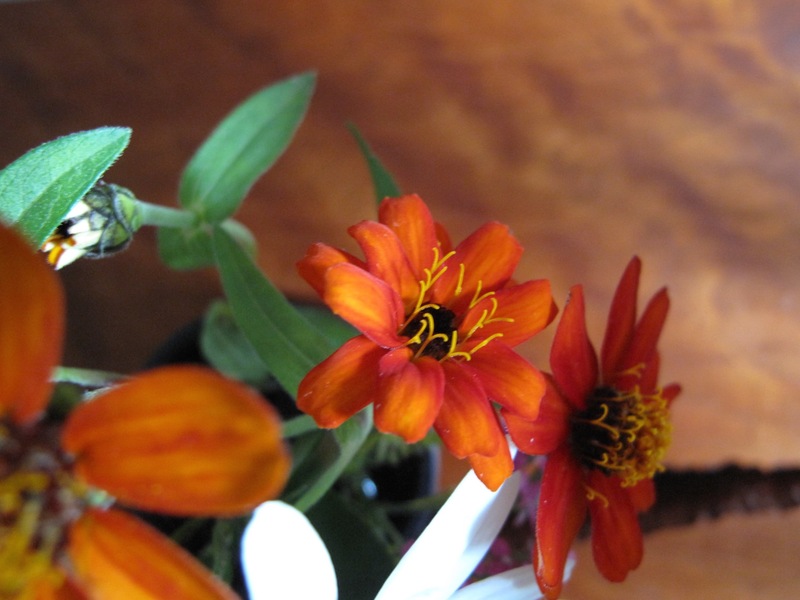 The wood of the table has a warm color that I thought would complement the reddish-orange zinnias. We had a nice warm weekend, but today is much cooler and wet. I hope winter will be brief this year. I love the stunning colors and color contrast, so pleasing to the eye. Good job squeezing another week out of those fiery Zinnias. Winter seems to be clamping down on us here. Thanks Ricki. Was glad the zinnias could be reused. I like the camellias but have used them often recently, so nice to do something different. Your colorful foliage still makes a nice vase. Susie I adore these flowers…seeing daisies and zinnias is a delight this time of year. Thanks Donna. Each flower seems so dear as we head into winter. Beautiful. I would hold on to that summer cheeriness for as long as possible. Who would think zinnias and daisies going into December? You’re right on target. I’m not a big fan of winter, but flowers make it more enjoyable. Gorgeous! It’s so fun to compare the various arrangements. Yours is so bright and hopeful! Thanks Beth! I agree, seeing the variety of vases each week is pretty amazing. It’s marvelous your zinnias could last so long, and the crisp pleated daisies look like perfection with them, Susie. I love your black Ikebana vase, it does a great job and looks good with the bright colors. Hannah, I like your description “crisp pleated daisies.” So appropriate. The black vase is very heavy and makes assembling an arrangement so much quicker and easier. What good friends to bring flowers for your birthday! They can bring so much joy. It’s been gray and rainy here this week but should clear up soon. It’s still plenty green here. Seeing your pretty daisies and zinnias cheered me up on this dull, gray day. 🙂 I miss having flowers in my yard, but this is the next best thing! Glad to share flowers with you Eliza while I still have a few. Hope the sun shines for you soon. Thank you, it’ll come out eventually! Thanks Cathy. The early sun added a warm glow. What a lovely cheery vase for dull November. How wonderful that you still have such lovely flowers blooming in in your garden. Thank you. It’s getting harder and harder to find any flowers here. I’m amazed you have so many. Sweet! One of my favorite zinnias, and it looks great with the white daisies. Thanks Jason. These didn’t bloom very well this summer, but finally picked up again about Sept. Usually zinnias are fine in the heat.